From hellscapes to Mario 64. If you’re looking to observe this special Doomversary—a whole 25 years—you should check out 2018’s Cacowards. 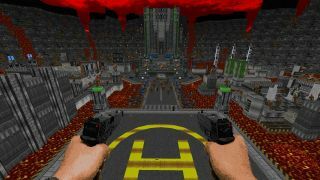 Doomworld shines a spotlight on the best Doom maps and mods every year on the game's anniversary, and you’ll find plenty of great WADs in the list this year. Browsing the top ten, the mods are often worlds apart in tone, art and systems. Maskim Xul, for instance, sees you exploring a haunted, eldritch mansion, while The Golden Souls 2 looks more like Mario 64 than Doom. They’re an eclectic bunch. If you fancy some fast-paced multiplayer, Quake Champions: Doom Edition, which won the multiplayer award, might be more up your street. It's exactly what it sounds like: Quake Champions made in Doom. Some of these are beefy megawads, much like John Romero’s upcoming Sigil. Struggle—Antaresian Legacy has a whopping 33 maps, for instance, some of which will take 30 minutes or more to get through. It’s not a quick jaunt through Hell. Andi Hamilton explored the Doom mod scene way back in 2015, which we've republished for the 25th anniversary.